1. Wonder what it would be like to have your house fixed up on HGTV? In an AV Club article, one homeowner explains what it was like to have his taken over by the Curb Appeal: The Block crew. Not sure I’d be brave enough to let any makeover crew with cameras into my house, would you? The story (and floorplans!) behind “Hansel,” Hugh Comstock’s first fairytale cottage in Carmel. One of the first “house blogs” I found back in 2008 when I started blogging myself and was looking for kindred spirits was Pat’s Back Porch Musings. She’s now selling the house that has been showcased not only on her lovely blog over the years but places like Romantic Homes magazine. You can see the listing here and a tour of the house on her blog here. Glennon says that when she posted a photo of her kitchen recently on her blog Momastery, she immediately started getting messages from readers with suggestions for how to update it. I loved her response. For very sad reasons, Robin Williams’ house has been a top search on my blog this week (it went on the market earlier this year and is still for sale). I read that fans are tracking down the houses from Mrs. Doubtfire and Mork & Mindy and leaving flowers and messages for him in front of them. A lot of us grew up watching him and feel like we knew him — and the houses he made famous onscreen. 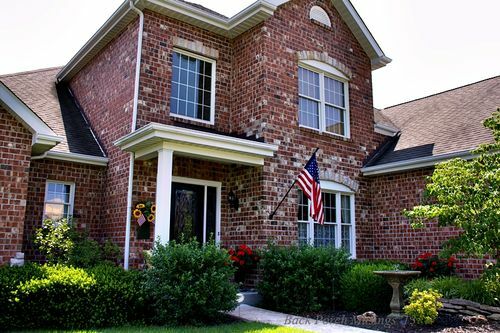 After this house in Bucks County got an exterior color makeover, it sold within hours of being on the market. I love its new look. Check it out on Maria Killam’s blog. Have designed/installed gardens and renovated homes for decades. HGTV has been interesting factor. At the start of HGTV era clients learned enough to ask specific questions and want specific stuff for their home. Now, it is similar to era without HGTV. Clients are not asking for specific stuff or knowledgeable about xyz for their landscape. Odd, yes? My clients are typically women 50+ with disposable income who have had their spouse do their own thing with money, paid for the kids to have a nice life and now my clients are treating themselves. If HGTV is ever mentioned it is in the ‘negative’. I don’t want an outdoor kitchen like HGTV kind of stuff. Sad. HGTV, moons ago, did have reference points for my client niche. 2008 brought another client segment into my business niche. Women, divorced/widowed, age 70+ spending a chunk of change to get their garden and home renovation beautifully completed to see them thru to the end. These women are my greatest satisfaction. Why? What an honor to be chosen to help them stay in their home. If they get health issue and the house/garden are stressful they will have to move. Congrats on the LA Times quotes. You go girl ! That’s really interesting to hear how things have changed from your perspective as a designer, Tara. Thanks for sharing! Thanks so much for including our home, Julia. We truly appreciate your generosity! I went by Kim’s, this morning, for your sun room tour. Absolutely beautiful. It looks like a dream! I love how it turned out, Maria. Such a beautiful house! Funny coincidence, I saw Glennon’s piece on kitchen gratitude the other day. This morning, I’m standing in my kitchen, savoring that first sip of coffee and I think, I should send that link to Julia, she would totally “get it”. And here it is on your blog! It is almost like we are actual friends. I loved her piece. But it has taken me some wisdom and maturity to get to a place in my life where I’m grateful for what I have instead of anxious about what I don’t have. For me it is a much better place to live. Thanks for keeping this perspective in your writing. As much as I love a good ogle of a celebrity house, I love my little 1950’s rancher the best! Congratulations to the woman who ruined “House Hunters” by exposing the big “Santa Clause” secret! (Per the LA Times) What a bit of notoriety. 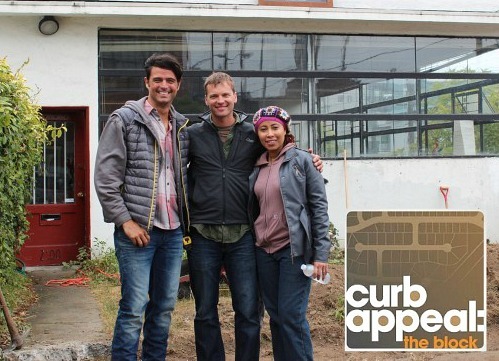 Curbed Appeal has one of the few HGTV teams/designers (the only? does Candice Olsen still do shows?) I’d actually want working on my home. Despite the problems the homeowners faced, the end results I’ve seen have been worthwhile. ALso, the small fixes they showed were instructive in showing how small changes could improve your curb appeal, like a throwback to the time when HGTV did design. I do love seeing the results of the Curb Appeal shows. They usually do a nice job. Shame about the problems that homeowner in that article had to deal with afterward, although he seems to have a pretty good attitude about it! Congrats on the interview! Thank you so much for sharing the kitchen love post. I live in an old rental home that is far from blog worthy. Every other day I want to rip everything out of the kitchen and start from scratch. Of course, I don’t have 50K on hand to do so–nor does the landlord. So, I’ve learned to live and love what I have. I notice there are no rain gutters on the Bucks County house, just very pronounced overhangs. I wish I could get away with that at my house. Gutters are such a pain! Too often I see on TV and even on some Home blogs concerns that something is dated just because the house is 20 years old, yet we love those quaint old bungalows and craftsman style homes and their original features. How often are we being influence by HGTV or similar in determining what we like? As the environmental generation, are we just a little concerned about tossing out cabinets and hardware because a TV show said this is out or this is in? My grandmothers made glorious meals in tiny kitchens. My mother never talked about updating her kitchen. She liked to sew and would change out curtains and move things around a bit, but never changed something expensive just because it was out of fashion. She was a child of the depression. If it worked and it was clean, it was good to go. I enjoy home blogs very much. I like the creativity and ideas I see and I understand being affected by one’s environment and needing to change out something that just is not comfortable. I get that and I’ve done that. I just do not like being told something attractive and functional like a natural oak cabinet is “dated”, or a certain color hardware is “out” or a type of backsplash will be passé soon. Real creativity is taking what you got and making it reflective of your personality and style – making a home that makes you and your family feel warm and comfy. Sorry for the long post – this is an issue which has really been bothering me lately! Loved your favorite room at Kim’s. I’m still so sad about Robin Williams. My son’s friends were here and they loved him in Aladdin. We went to a party last night and everyone was talking about Robin Williams and how sad we are about his death. He’ll be missed! I loved the fairy tale cottage and its back story! So sweet! The Missouri house is really well appointed and its outdoor spaces are really lovely. Glennon’s post was a good reminder to us all, that the kitchen is the heart of the home not because of its decor, but because of all the living that happens there. I’m terribly sad about Robin Williams. My husband and I listened to his stand-up stuff on the way home from the cottage this week. There were a few teary moments, for sure. The difference in the exterior of that gorgeous old home, just from new paint, is quite astonishing. Love your guest post about your sunroom. Congrats on The Times article! HGTV’s Curb Appeal did several houses in a neighborhood here in Euless, Texas a year or two ago. I have to say in my opinion (and other locals I’ve talked to) they didn’t exactly improve things that much. One of them got this pretty bizarre looking framework thing on the front that I suspect would have to come down before you could sell the place. That block was in one of the newer/nicer areas of town, anyway. There are some older areas in the southern part of Euless that could have benefited from a block makeover much more, I think. I love that you still get credit for creating all the controversy around the staging of HGTV shows!!! You just verified what we all secretly believed anyway!!! I know, it’s crazy, right? Ha. The crew from Flip or Flop is on the first photo of the LA Times article, so I thought I’d share a beef I have with them. My dad signed my mom and myself up to what was being advertised as a free information session on flipping houses with “Tarek and Christina of Flip or Flop!”. During the two weeks leading up to the session, we got emails “from” Tarek and Christina saying things like. “See you there!” and “We can’t wait to visit Atlanta!”. When we got there, it was a company wanting you to invest with them and pre-recorded videos of Tarek and Christina. They said the videos were made becaue of T & C’s busy shooting schedule. Such a scam! What was even more scammy is when we walked out after realizing it was a scam and a guy called after us and said, “What, you’re only here for the TV stars?”. Obviously, T&C were paid tons on money to associate their names with this company. So gross. Oh, wow. I hadn’t heard about anything like that going on. Interesting — thanks, Rachael!